Home › Alternatives › It’s not Quitting– It’s the Modern Day Equivalent of Hunting a Lion. I just posted an article about 5 reasons to let your kids quit school, but I’m inspired by something I read yesterday by Erika Christakis —What the Pygmies Can Teach Us About Child Rearing, about using evolution to guide our parenting choices, and I thought to myself- leaving school is not quitting, it’s allowing your teen the opportunity to explore the modern day equivalent of hunting a lion! 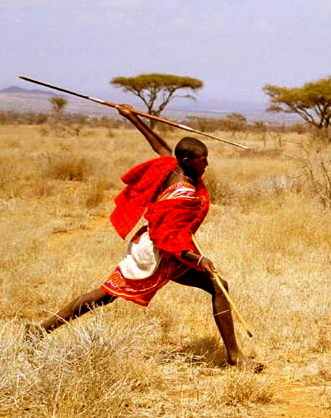 Hunter-gatherer childhoods are easy and playful, but adolescents are expected to go out and hunt lions. We seem to have things backward in our contemporary world, pushing our very youngest to do things that don’t make neurological or developmental sense while asking relatively little of our older kids. Human beings are endlessly adaptable, and it’s unrealistic to think we could or should step back in time. But if we want to stop the current slide toward depressed, unhealthy young people, maybe we shouldn’t ignore 6 million years of evolution either. I love viewing child rearing through an evolutionary lens. This lens has guided my decisions about raising my own children so far– home birth, extended breastfeeding, co sleeping, etc… And what I notice is that I have extremely happy, well adjusted children. While this blog is about teens and how we think about teens, I don’t think that we can downplay the importance of the first part of childhood. A child reared in an attached -connected way, continues to value the relationships around him, and is prepared to act as a young adult as he approaches his developmentally appropriate age. Teens are young adults. This concept of prolonged adolescence is relatively new in human history. So is this concept that we are individuals above communities and that community participation is optional. In traditional societies teens took on big responsibilities as hunters, warriors, parents. The period of coming to age was marked by ritual and magic, and walkabouts and vision quests. These rites of passage gave older kid/young adult humans (right on that precipice) an opportunity to go deep, explore their own sense of power, find their strengths, and connect deeply to themselves and their communities. In today’s world, teens go to school, where really they have little choice and no power. And where their communities are artificial monocultures of teenagers with no real connection to adult responsibilities and freedoms. They have natural drives to take risks, explore their spirituality, find meaning in their lives. Drives that have been shaped by 6 million years of evolution. And if all they have around them is a school where they are unhappy or don’t see the point, and a peer group with the same natural needs and drives– it’s no wonder teens engage in risky, dangerous behavior. I’m not in any way endorsing actually going out and hunting lions- unless that happens to be your thing (and even then), or returning to our hunter gather days and some of the more unpleasant things that happened in those societies. What I am endorsing is giving your teen freedom and opportunity to go deep and find his or her sense of power and purpose. And helping your teen find real connection with you, and other members of your community. And asking yourself if school helps your teen accomplish this. For some, perhaps it does. Is you daughter discovering her true deep interests? The depths of her soul? How to find and follow and succeed (or fail) in what she herself wishes to pursue? What is your relationship like with her? or with your son?? Paradoxically by taking care of your teen, listening to him and letting him leave school (quit? take the easy way out? – from societies perspective), you are giving him a new level of responsibility and the freedom to take on real-life adult roles and adventures, and the modern day opportunity to go out and hunt his own lion.